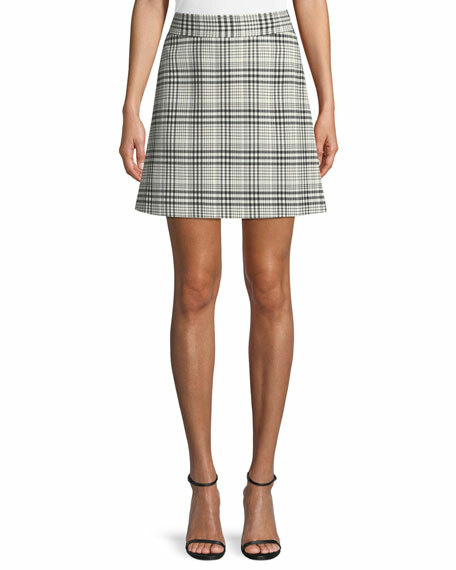 Theory skirt in Brea check. Alice + Olivia "Bunnie" skirt in mixed printed stretch knit, featuring striped design. Mid-rise; contrast waistband. A-line silhouette. Back zip. Alice + Olivia "Bunnie" skirt in mixed printed stretch knit, featuring striped design. Mid-rise; contrast waistband. A-line silhouette. Back zip. Mini length. Viscose/polyester/spandex. Imported. Cushnie Et Ochs dress in light power viscose. High-waist; belt loops. Hidden back zip. Body-con fit. Arched, curved hem. Viscose/nylon/spandex. Cushnie Et Ochs dress in light power viscose. High-waist; belt loops. Hidden back zip. Body-con fit. Arched, curved hem. Viscose/nylon/spandex. Lining, silk/spandex. Dry clean only. Made in USA of Italian materials. Model's measurements: Height 5'11"/180cm, bust 33"/84cm, waist 24.5"/62cm, hips 34"/86cm, dress size US 2. Maggie Marilyn "We Can Climb This Mountain" pinstripe skirt. A-line silhouette. Front flap pockets. Mini length. Back zip. Cotton/polyester/spandex. Polyester/viscose lining. Dry clean. Made in New Zealand. Model's measurements: Height 5'10"/177cm, bust 33"/84cm, waist 25.6"/65.2cm, hips 35.8"/91cm, dress size US 2-4/FR 34-36.